My seven year old daughter suffers from severe asthma and allergies and one of the products that her pediatrician recommended for us to use is a saline nasal wash. Since we like to use naturally derived products as much as possible, this was something we were willing to try, especially since allergy season has been especially harsh this year. 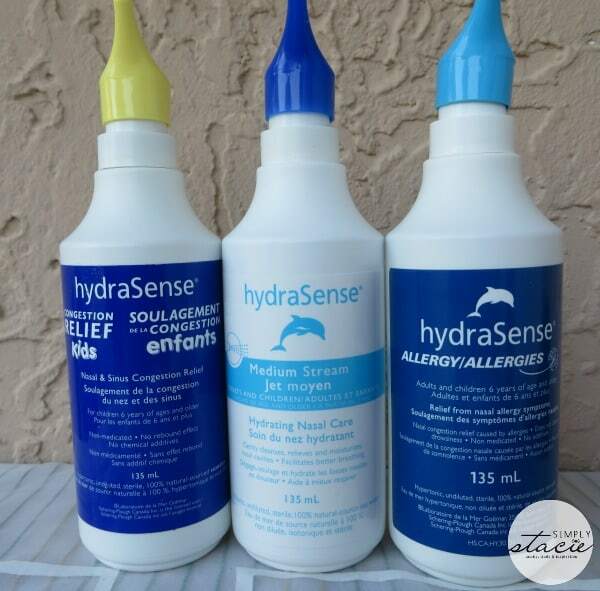 hydraSense has a full line of products for adults, children and even babies to help provide relief from nasal allergy symptoms. Hannah was very willing to try these products as she was suffering from a stuffy, irritated, swollen nose, watery eyes, excess sneezing and a dry, itchy throat. As I learned more about their available products, I was pleased to learn that hydraSense does not have any additives, is non-medicated and will not cause the dreaded drowsiness that is experienced with Hannah’s “other” allergy medication. 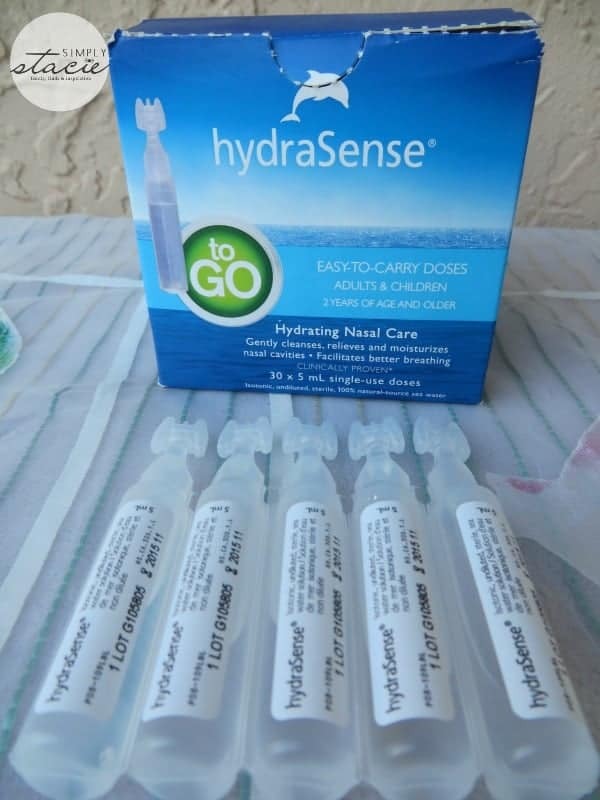 We tried several products in the hydraSense Daily Nasal Care line including Congestion Relief Kids, Medium Stream Hydrating Nasal Care and the Easy-To-Carry Doses. The nasal care products are made using an isotonic (concentrated salt) solution which is made of 100% naturally sourced seawater which is “desalinated through electrodialysis until it reaches 0.9% in order to preserve the minerals and trace elements”. You are able to choose the stream that is right for you and your family i.e. Easydose, Ultra-Gentle Mist, Gentle Stream, Medium Stream or Full Stream. My daughter tried the medium stream nasal care product first which she said was much more comfortable than other brands we have tried in the past. After using this product as recommended for one day she said that her nose “hurt less” and she could “breathe better because it isn’t clogged as much” as it was prior to using it. We used this every day during the allergy season and she was actually able to play outside despite the high pollen count with lessened symptoms. I especially like having the convenient Easydose vials in my asthma emergency pack that we take with us when we are on the go because we could use it as needed to “cleanse, relieve and moisturize” her nasal cavities when camping, hiking, biking etc. While Hannah still suffers from asthma and allergies this product did bring relief which she said makes it much better when she is having an allergy attack. She said that when using this product line it makes her nose “feel cleaner and less stuffy” and she will ask me specifically to use it when she notices allergy symptoms coming on. When my boys were suffering from a mild cold, they also used the hydraSense Congestion Relief Kids to provide nasal and sinus congestion relief. My nine year old had been complaining of a sinus headache which was lessened significantly by the second day when using this product as directed. My youngest son didn’t like the feeling of the spray but admitted it “really helped” his nose “feel better” so he reluctantly tried it again as needed and gives it a thumbs up for effectiveness. If you or someone you care about needs relief from nasal or sinus discomfort then I highly recommend visiting the hydraSense website to learn more about this nasal care product line. Which product would be the best for you or our family? I like that they contain all natural ingredients, a bonus with me. I learned that hydraSense® nasal hygiene products contain a preservative-free, sterile seawater solution rendered isotonic through a selective separation technique called electrodialysis. I learned that it contains all natural products which is a bonus for me. I learned that there are two types of hydraSense® solution available: isotonic and hypertonic. I learned that Hydrasense offers isotonic and hypertonic solutions. Hydrasense products contain 100% natural-source seawater . I learnt that they would really help my allergies , glad you posted about them. Much to my delight, I learned that everything used to make the product was natural. I learned that it also conditions unlike plain saline solutions. I learned, and like, that they have a baby products line. My baby has a cold right now and I am so happy to discover that I can get something that will give her some relief from her stuffiness. I will be looking for these products immediately, particularly the aspirator and the ultra gentle mist. Thank you! My kids would Definetly benefit from this. My head is throbbing. We have had colds, pink eye, ear infections, fevers and croup since March break. Thinking it maybe allergies. My head has been throbbing all day. I like the baby center and the articles and tips they offer. I learned that Hydrasense offers isotonic and hypertonic solutions!!! I like the Dolphins Club.I signed up for coupons. I won a gift basket from them a while ago and I just love these products. Though I am usually going with the gentle mist or the one for babies, I believe al of their products are really great. made with 100% undiluted natural-source seawater. I learned that it contains all natural products. That’s wonderful ! I learned that the salt concentration in Hydrasense is similar to that in the human body. It is 100% natural-source seawater. I learned there are easydose vials for people on the move.